Established in the 1870's, Delacre was first known for its Belgian chocolate. Thanks to Charles Delacre's use of only the finest ingredients in their reputation led to an appointment as purveyor of to the Belgian Royal House in 1879. In the 1890's the Maitres Patissiers of Delacre applied their Savior Faire to making fine biscuits covered with their own rich chocolate. Soon their biscuits became so popular, Delacre began to produce them exclusively, with the same demanding quality standards that make their chocolate famous. These crepes wind themselves in crispy and fine pleats and are enrobed with Belgian chocolate. Loc Maria now makes these incredible cookies in the Delacre style! 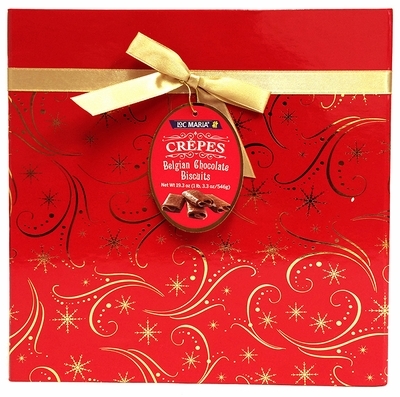 These Loc Maria crepes ship in a festive Red Metal Tin with a Gold Ribbon.